Brenton Fuchs, BSBA '12, accepts his award from Learning Ally. Photo courtesy Bushnell Photography. Brenton Fuchs is no stranger to adversity. Fuchs, BSBA '12, has been visually impaired since birth, but that hasn’t stopped him from achieving success and helping others. On April 27, the nonprofit organization Learning Ally honored Fuchs with the Mary P. Oenslager Scholastic Achievement Award at its annual awards ceremony in the nation's capital. Fuchs, along with five others, received the award in recognition of his hard work and accomplishments while dealing with a visual disability. The Connecticut-native graduated from Kogod with honors before taking a position at Unilever as a marketing specialist. He uses his experience to help others by volunteering as a peer mentor for young people working through educational disabilities. 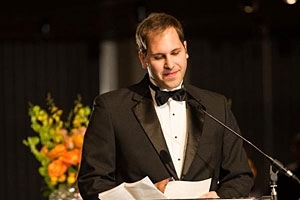 "I want to take my understanding of marketing and…market people with disabilities to the general population," Fuchs said in a video shown at the award gala. Fuchs isn't content with just personal success. He wants to use his experience to help others by "dispelling rumors and preexisting notions of what [people with disabilities] are capable or incapable of doing." His commitment to helping others facing similar challenges on top of his personal success made Fuchs an ideal candidate to receive the Scholastic Achievement Award. Learning Ally helps individuals with physical or learning disabilities that make traditional means of learning difficult. The nonprofit has built the world’s largest collection of audiobooks and developed programs that cater to children, adults and educators. Each year, Learning Ally honors six individuals, three with visual impairments and three with learning disabilities, for their outstanding academic performance and service to others. Along with receiving the honor, Fuchs received a $6,000 award, and met city officials and members of Congress.